Pentagon review finds hundreds of military had Iraq chemical exposure. 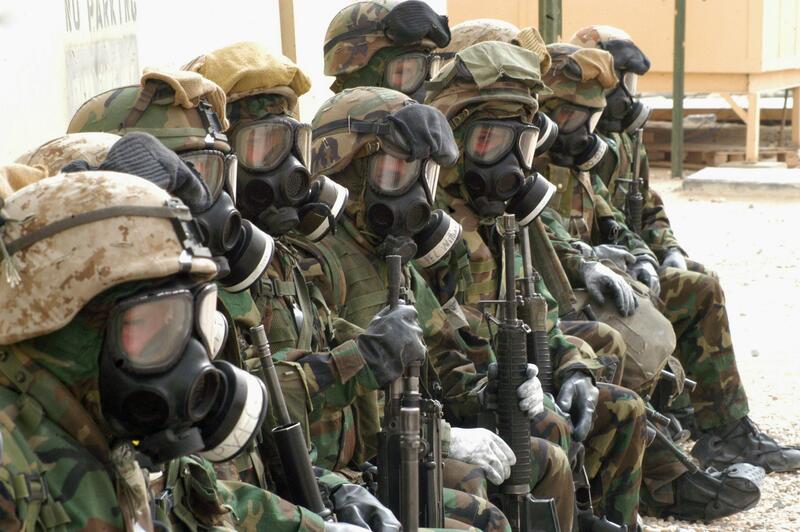 U.S. soldiers wear chemical protective suits and gas masks at Camp Commando in Kuwait. The Pentagon’s disclosure abruptly changed the scale and potential costs of the United States’ encounters with abandoned chemical weapons during the occupation of Iraq, episodes the military had for more than a decade kept from view. This previously untold chapter of the occupation became public after an investigation by The New York Times revealed last month that while troops did not find an active weapons of mass destruction program, they did encounter degraded chemical weapons from the 1980s that had been hidden in caches or used in makeshift bombs. The Times initially disclosed 17 cases of American service members who were injured by sarin or sulfur mustard agent… But an internal review of Pentagon records ordered by Defense Secretary Chuck Hagel has now uncovered that hundreds of troops told the military they believe they were exposed, officials said… Having not acted for years on that data, the Pentagon says it will now expand outreach to veterans. One first step, officials said, includes a toll-free national telephone hotline for service members and veterans to report potential exposures and seek medical evaluation or care.